Henry Reed was born and educated in the industrial city of Birmingham. As an adult, he served in the British army and the diplomatic corps. He then began a career as a journalist in London, where he was well known for his wit and satirical imagination. More limited in output than any other significant poet of his generation, Reed's fame rests entirely on a single work. Constantly anthologized everywhere in the English-speaking world, 'Naming of Parts' has long been one of the staples of modern poetry. (The story goes that a faculty member, introduced to the poet for the first time, said, 'Oh yes, Mr. Reed, I've read your poem.') Excerpted from a longer poem published in Reed's first volume, A Map of Verona (1946), 'Naming of Parts' contrasts gentleness with rude actuality, the voice of a man of action with the musings of a dreamer. In the process, it transcends the fact that, in spite of its Cockney lilt, the language of most of the poems is as flat as the prose of a training manual. That's a lovely summation, and apparently the source for the story's appearance in the Encyclopedia of British Writers. 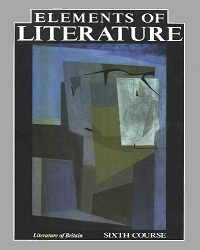 The Elements of Literature series was edited by Robert Anderson (1917-2009). Anderson was a playwright and screenwriter, best known for his 1953 play, Tea and Sympathy, which was produced as a feature film in 1956, starring Deborah Kerr ("Years from now when you talk about thisand you willbe kind"). Anderson would seem to be a reputable source, so I'll go ahead award him the points he's due. I wonder who the offending faculty member may have been?